People are angrier than ever about corruption but feel that governments and organisations are failing to do enough about it, according to experts speaking at the 17th International Anti-Corruption Conference in Panama. From Brexit to the election of Donald Trump in the United States, participants in the ‘Time for Equity’ session said that people are feeling “frustration, anger, angst” about what is happening in the world around them, and that sometimes the expression of that anger is sending them into the hands of populist leaders. He said that too much time had been spent thinking about the corruption of individuals and “not enough time thinking about the corruption of institutions,” and when large institutions and systems failed those they are meant to represent, people felt disenfranchised. He said that while organisations like Amnesty “share the analysis” that parts of the system are broken, the difference is how they want to fix it. “Figures recently showed that 1% of the world’s population own 50% of the world’s wealth. Just a few years ago it was 45%. Brexit, Trump, is a kind of push back on that, unfortunately it’s the wrong way,” he said. Part of the problem, he suggested, is that organisations are losing the “discourse battle” on how these problems can be fixed. He said he often asks his staff if they know anyone who voted for Brexit – the UK referendum on leaving the EU. “The answer is usually ‘no’. But how can you not know 52% of the country? We need to speak the language,” he said. 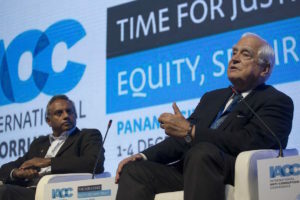 Peter Eigen, chair of the Advisory Council at Transparency International, said that part of the problem is that the “big issues” like climate change or human rights abuses take longer to deal with than any government is around for so the “traditional paradigms of government don’t work any more” and a more collaborative framework is needed. María Soledad Pérez Tello, the minister for justice and human rights in Peru’s Congress, said when it comes to corruption we also need to look at our personal responsibility; rather than worrying about being caught for doing something wrong, she said people should be their own judge and moral compass. Laura Dixon is a British freelance journalist currently based in Bogotá, Colombia. She is a former staff writer for The Times and has written for The Guardian, Monocle magazine, Vice/Munchies, and The Pool. She lived in Chile after taking a Masters in Latin American Studies and has remained committed to reporting from the region ever since. She has previously received the Financial Times’s Sander Thoenes Award for young journalists with an interest in emerging democracies and the CSIS’s transatlantic media fellowship.